Cattle and hog inventories were down on July 1 compared with the same day a year earlier. This was the first year-over-year decrease in hog inventories since July 2014. Cattle inventories have continuously decreased since July 2005 with the exception of a small increase in July 2017. However, sheep inventories rose for the first time in seven years. On July 1, Canadian farmers had 12.4 million cattle on their farms, down 0.8% from July 1, 2017. Inventories were 26.3% below their peak level recorded in July 2005. Cattle producers retained less breeding stock in 2018, as the number of beef heifers held for breeding on Canadian farms was down 2.6% to 669,900 head compared with the same date a year earlier. The number of beef cows decreased 1.2% to 3.7 million head. The inventory of calves on July 1 decreased 1.3% to 4.0 million. The number of feeder heifers increased 2.7%, while the number of steers decreased 1.3% from July 1, 2017. As of July 1, 72,660 farms reported inventories of cattle and calves, down 1.8% from July 1, 2017, and down 3.5% from the same date in 2016. Canadian farmers had 1.4 million dairy cows and heifers on their farms, up 0.8% from July 1, 2017. Total disposition of cattle and calves rose 3.5%, driven by higher cattle slaughter levels during the first half of 2018 compared with the same period in 2017. Total cattle slaughter increased 6.1% to 1.7 million head over the first six months of 2018, marking the third consecutive year-over-year increase. International exports of cattle rose 0.9% to 342,000 during the first half of 2018 compared with the same period in 2017. 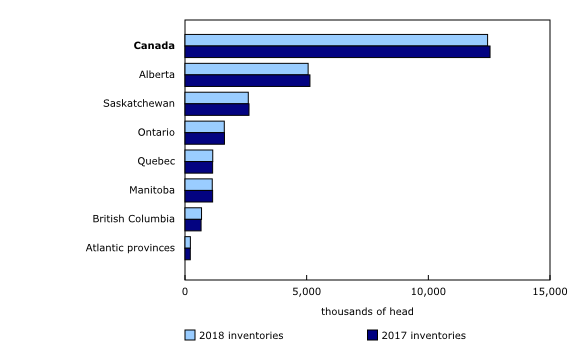 Canadian slaughter cattle prices were lower on average during the first half of 2018 compared with the same period in 2017. Hog producers reported 14.2 million hogs, down 0.4% from July 1, 2017, and the first decrease in four years. However, the hog inventory remains 11.1% above the July 1, 2014 level. As of July 1, there were 8,115 farms reporting hogs in Canada, down 2.5% from the same date a year earlier. These farms reported 1.2 million sows and gilts, up 0.3% from July 1, 2017. 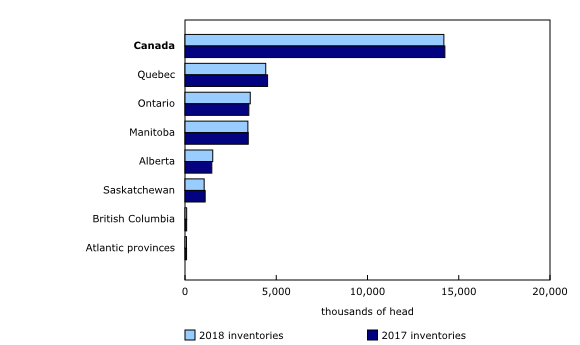 Canada exported 2.7 million hogs in the first half of 2018, down 6.9% from the same period in 2017. 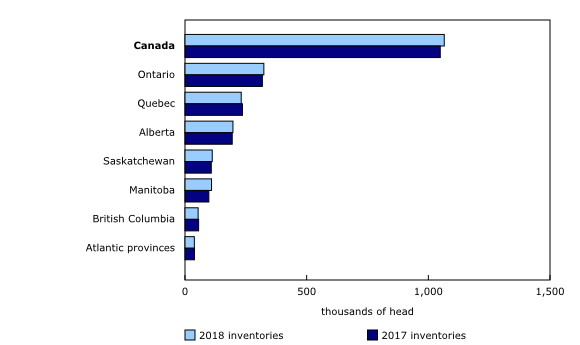 Hog slaughter decreased in Canada in the first six months of 2018, down 0.7% from the same period in 2017 to 10.8 million head. The January-to-June 2018 pig crop was 14.1 million head, down 4.5% from the same period in 2017. Canadian hog prices fell during the first half of 2018. Canadian farmers held 1,065,400 sheep and lambs on July 1, 2018, up 1.6% compared with the same date in 2017 and the first increase in seven years. The sheep breeding herd increased, with the number of ewes up 0.9% to 524,800 and replacement lambs up 1.6% to 92,700. Meanwhile, the number of rams edged down 0.8% to 24,200. The number of market lambs increased 2.5% from July 1, 2017, to 423,700.
International exports of sheep decreased 4.3% from the same period a year earlier to 4,400 head in the first six months of 2018. Canadian lamb prices increased in the first half of 2018 compared with the same period in 2017. Livestock estimates are available for Canada and the provinces as well as for the United States.